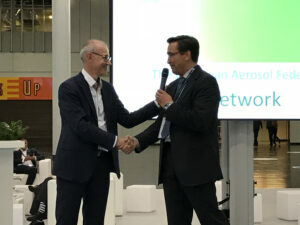 The European Aerosol Federation (FEA) has elected a new President. Gilles Bardin (left) accepts the FEA presidency from outgoing President Rolf Bayersdorfer. This occurred at the FEA’s Global Aerosol Events 2018 in Dusseldorf, Germany.